The Samsung Galaxy Note II retail package includes a wall-mount charger, where you plug the supplied microUSB cable to charge your phablet. There's also a nice one-piece headset with several spare earbuds (so you can find the right size for you), identical to the one found inside the Galaxy S III retail package. That's all the basics covered, considering that the Note II offers ample storage out of the box. The bad news is that the MHL adapter required for HD TV-out and the USB adapter enabling the USB host functionality aren't included. It's a real pity - both work pretty well but this way some users will probably not bother purchasing them and won't get a chance to try them. The Samsung Galaxy Note II measures 151.1 x 80.5 x 9.4 mm, which makes is slightly taller, but narrower and slimmer than its predecessor. And while it is notably larger than even the biggest droids with their 4.7-4.8" screens, the Note II is reasonably easy to fit in a pocket. The weight has remained virtually unchanged - the original Note tipped the scales at 178 g, while the Note II comes in at 180 g. It certainly won't let you forget that it's in your pocket, but to put things in another perspective, it weighs less than the Nokia Lumia 920 and that one has neither a 5.5" screen, nor a 3100mAh battery. You don't have to guess very hard what inspired the Samsung Galaxy Note II's design. From a distance, you'll have a really hard time telling the phablet apart from a Galaxy S III, particularly if the two aren't sitting side by side. We are still not quite impressed by the hyperglaze finish but it somehow looks better on a bigger scale. It could be that we are more willing to forgive the use of plastic here, as metal would've blown the weight limit. Or maybe it's just that any device with such awesomely large screen and tiny bezels will look great. Either way, the Samsung Galaxy Note II is quite the looker and, while that's not too hard for a device of its size, it does make an impression. The second-gen phablet is available in Marble White and Titanium Grey and we got the chance to try both versions. We have a white one for the review, but last month we handled the grey phablet back at IFA and we appreciate the former better. The ambient light sensor and the status LED are on the left side of the earpiece. From the settings you can choose the types of events that light up the LED - charging and low battery, missed calls and during voice recording (only if the screen is off). You can add even more events or customize the colors for the preset events, but you'll need a suitable app from the Play Store or rely on the ever knowledgeable guys over at the XDA-developers' forum to come up with a tweak. Speaking of the ambient light sensor, we have to note that the Samsung Galaxy Note II got the same RGB sensor as the Galaxy S III, the one that's capable of detecting the full spectrum of the ambient light, rather than just its green channel. This leads to improved performance under some types of artificial lighting. Also, Samsung has implemented a new way of controlling brightness, allowing you to fine-tweak the brightness without disabling its automatic mode. You set an offset, so your Galaxy Note II screen will always be slightly brighter or dimmer than the automatically selected level. Below the screen is the classic arrangement of physical hardware Home key flanked by the capacitive Menu and Back keys. This layout has been in use since the early days of the Galaxy line and Samsung decided not to put the Android keys on-screen (as Google suggests) even on a screen this big. Seeing how other manufacturers go about this however, we have to say we are glad Samsung stuck to its ways. You see, replacing the hardware buttons with on-screen controls would be great if the screen is stretched to make use of the freed-up space. Yet most other smartphones still have generous bezels down there, so in the end you end up sacrificing screen estate without getting anything in return. The Home key has a very soft press, but you get used to that quite quickly. The sides of the Note II hold no surprises either, a volume rocker on the left and a Power/Lock key on the right. Despite the ample available space there's no dedicated camera key here, which is a real pity. The primary mic is at the bottom, exactly opposite the secondary one. The microUSB port handles charging and data connections with a computer. It's MHL-enabled, so you can output HD video through an HDMI adapter or enable USB Host via another adapter. The stylus slot is at the bottom too, with the top of the S Pen curved to fit the shape of the Note II. The stylus itself isn't perfectly round like the original stylus, so it doesn't rotate in the slot, making it easier to put back in. The back of the phablet looks pretty barren - it houses an 8MP camera lens and a single-LED flash near the top and the loudspeaker near the bottom. The camera lens protrudes slightly, so the Note II rests on it when placed on a level surface, but judging from the original Note its hardened glass is not too easy to scratch. The back cover is removable and below it you'll find the beefy 3100mAh battery along with the microSIM and microSD card slots. The SIM card compartment is blocked by the battery, but the memory card is hot-swappable. The NFC antenna is on the back cover, so you are free to replace the battery without losing the NFC connectivity. The beefed up battery has better official specs - the Note II is said to last for up to 890 h of 3G stand-by over 820 h for the original Note. The maximum achievable talk time on the Note II is 16 h compared to 13 h 30 min on its predecessor. Drop to 2G and the Note II can give you 980 h of standby or the mind-blowing 35 h of talk time. 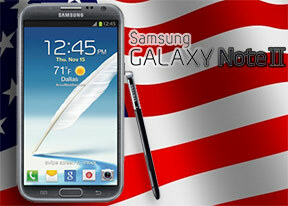 In the case of the US Galaxy Note II, it must be noted that the battery performance will slightly vary based on the carrier version you pick. We ran our tests on a T-Mobile device and witnessed similar performance to the N7100's. We ran own tests and the results are quite impressive. 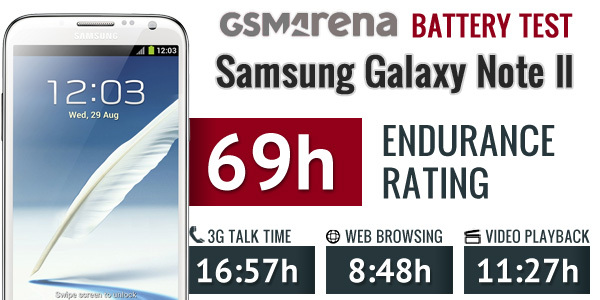 The endurance rating of the Samsung Galaxy Note II came out as 69 hours or almost three full days. This is how long you can go without charging the device assuming your usage is an hour of calling on a 3G network, browsing the web for another hour then watching an hour of video each day. That's certainly one of the most impressive scores we have seen and it proves that the Samsung Galaxy Note II is not only extremely capable, but also one that will stay with you for a long time, before it makes you run for a charger. You can get more info on the tests results from our blog post or if you want to learn more about our battery testing routine you can follow this link. After using the Note II for a while, even the massive Galaxy S III feels small (the flagship smartphone being narrower than the phablet). The difference in screen size is quite notable too - we were quite reluctant to switch back to the smaller screen. However, this is not to say the Samsung Galaxy Note II is impossible to pocket - tight jeans might not make it feel at home, but with average or larger pockets it's entirely possible to carry it around like any other phone.